Sharples Works Apartments is located in downtown West Chester, PA within walking distance of dozens of restaurants and boutiques. Charming and sophisticated, West Chester is in the heart of the Brandywine Valley known for its history, hospitality, and picturesque countryside. A unique community linked through landscaped courtyards and walkways, Sharples Works offers over 100 different floor plans of studio, 1-bedroom, and 2-bedroom West Chester apartments for rent catering to all individual lifestyles. Enhanced by rustic columns and beams and exposed brick walls, these luxurious apartments are designed in a soft industrial style that blends with the neighborhood’s vibrant atmosphere. Sharples Works was originally a 19th-century structure that housed the dairy industry’s first tubular cream separator. 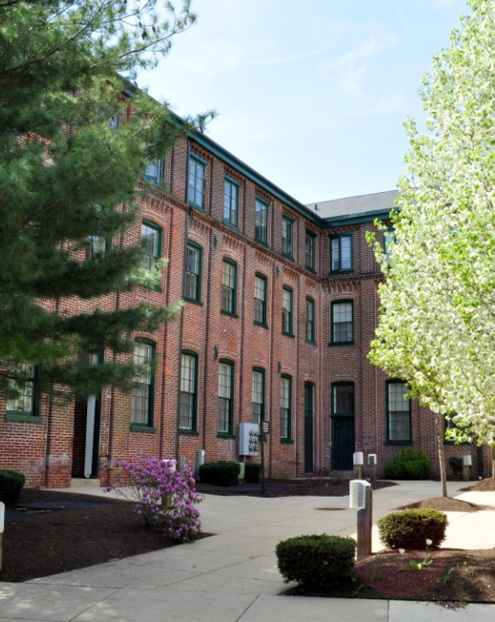 It was a staple production plant in Chester County, and the industrial space has since been transformed into West Chester apartments for rent by maintaining the detail and character that make it an impressive landmark. Sharples Works offers modern studio, 1-bedroom, and 2-bedroom apartment homes for rent in West Chester, PA.